I'm a professional watermedia painter that focuses on the Lowcountry, Italy and France. 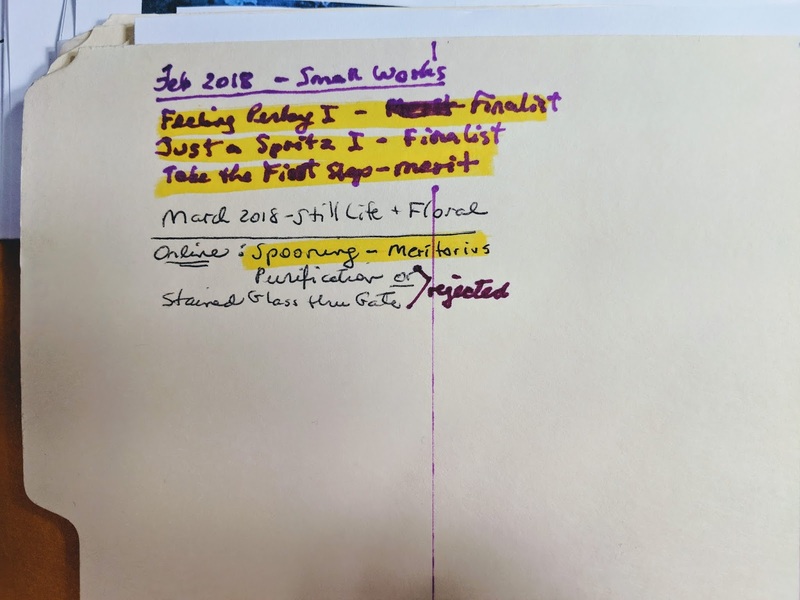 Think you're organized when it comes to entering competitions or keeping track of upcoming ones? That's our topic today as I try to answer some of your questions about this. 1. 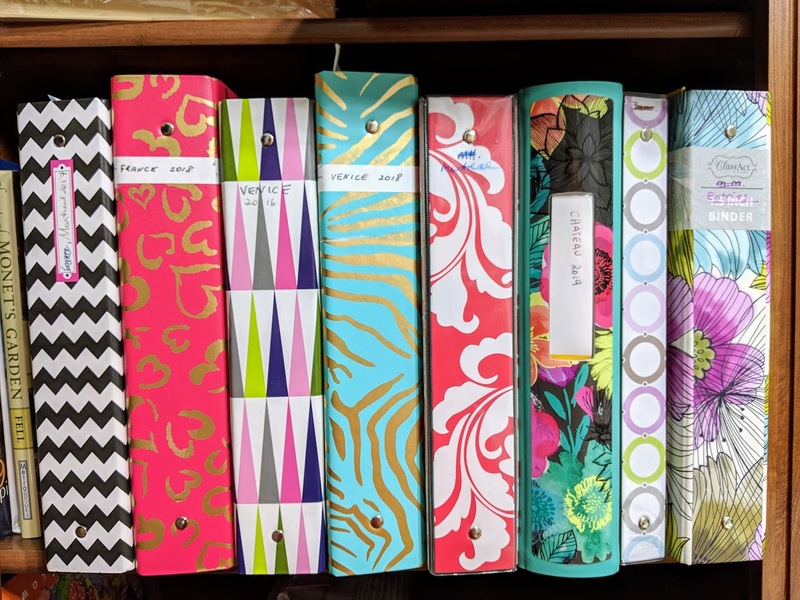 Buy a pretty binder. Because I keep it sitting on a shelf along with all my other pretty binders (for workshops, etc.). We are visuals, after all. I marked my binder "Entries". 2. Add Binder Dividers. The competition name goes on each tab and they appear alphabetically in my binder. I do this only after I decide to actuallly enter a particular show. Yes, your tabs will likely not fall in beautiful tabbed (visually sized) order, as you add another tab between 2 existing tabs, but it's a small price to pay. At some point in the future, buy another set of dividers and rename them so the tabs look pretty again if you prefer. 3. 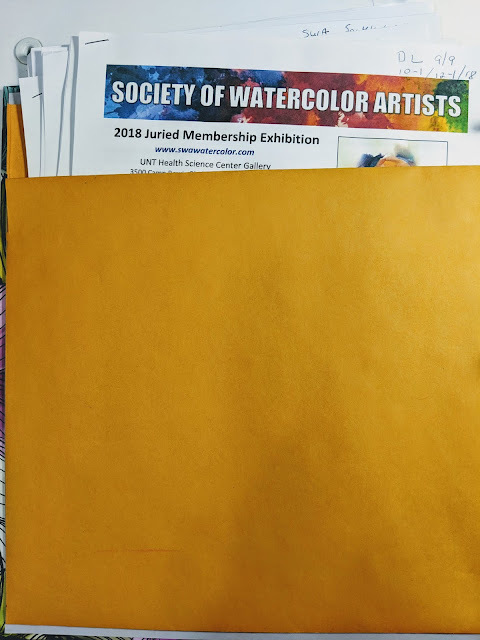 Behind the appropriate divider (let's say Watercolor Society of Alabama), insert a 3-hole punched Prospectus for the show (which you will download from their website). I highlight any important details that pertain to that show. 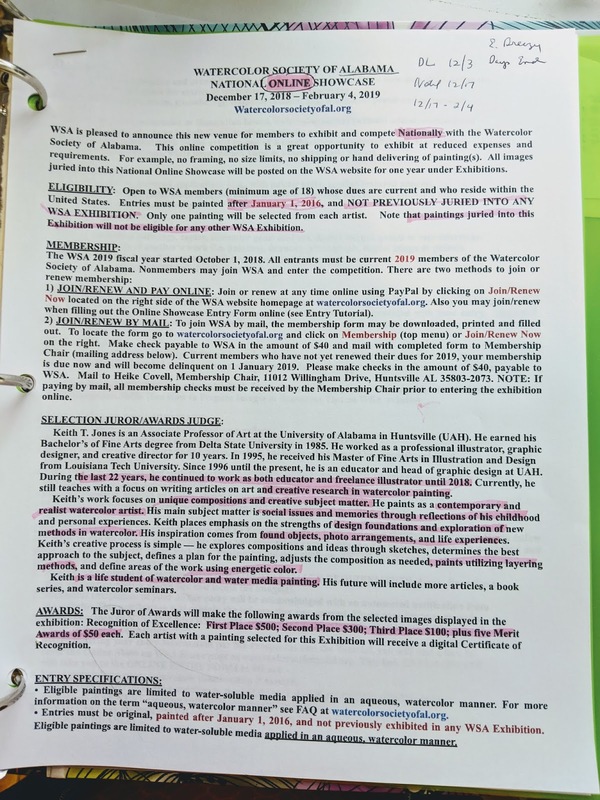 In the top right corner of the front sheet, I mark the Deadline date (DL), the Notification date (when they will announce those accepted), and the Show Dates. All this info is already written in the Prospectus, and I've highlighted it where it appears, but I need a quick reference available to me. So I always write it in the same top right spot. 4. To the left of the Prospectus (on the back of the Divider, in other words), I write what I entered into that year's show. If I enter a 2nd or 3rd year, they get recorded here so I always know what I've entered to this particular show. 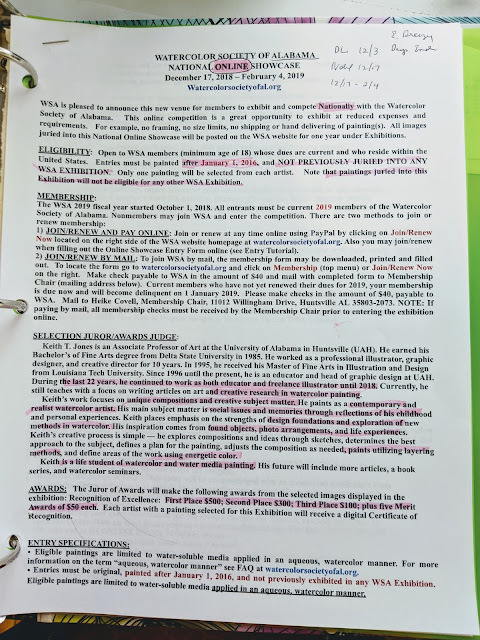 I also record whether a painting got accepted or rejected. 4. In the very FRONT of the binder, I add a calendar for each month of the new year. You may find a free, printable calendar HERE. When you open the file, all 12 months will print for you. Here's where I add the appropriate Deadlines for the shows I'm interested in or have already entered. 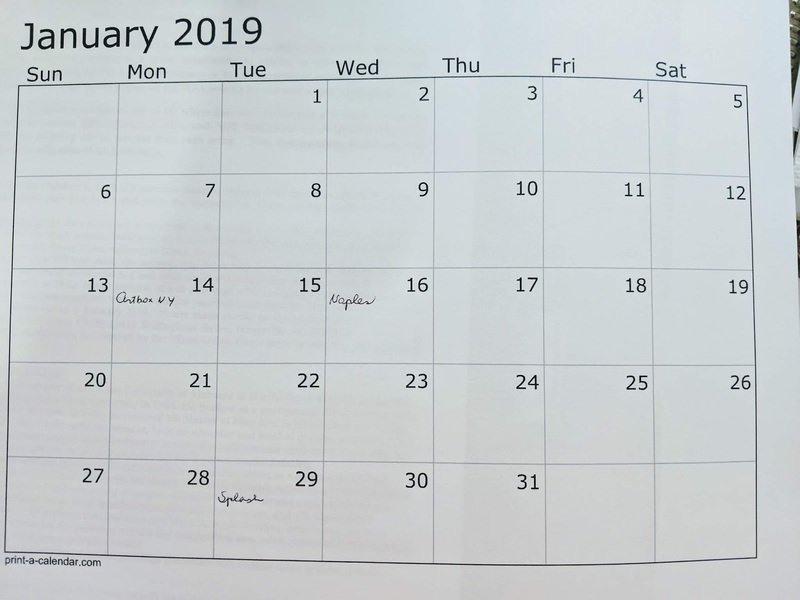 Next year, at a glance, I can transfer these dates to the following year's calendar (they're usually only off by a day or two, but it does allow me to not forget them). 5. At the very BACK of the binder, I've added a manila envelope, cut down on one side as shown, and double-taped to the binder. Into this envelope, I add any Prospectus I've printed but am NOT going to enter. At some point, I will end up looking through them again. Picture reading about a show in a magazine and thinking to yourself "didn't I already look into this one and reject it for some reason?". Easy way to check on it. On each prospectus, you could write the reason you had chosen not to enter. - Some shows require you to be a member of their organization in order to enter them. If that's the case, they ALWAYS allow you to join AS YOU'RE SIGNING up for the current show. Once you're a member, you will get emails from them, announcing upcoming shows way ahead of time. If you're not yet ready to become a member (because each one costs about $30-40), you could reach out to them via email and ask to be put on their email list instead. - Study each prospectus carefully. If they say the painting must have been created after a certain date, they mean it. - Never enter pieces that you created in a class or with a teacher's input. You could be banned from entering future shows and your name will circulate for many to see. - Don't enter shows if your only reason is to win a prize. The odds are heavily against you. I didn't enter shows for many, many, many years because I preferred having the painting available for my galleries or for festivals I participated in around the country (think booth setup). I'm just now starting to explore shows again because at some point you want to know if you measure up against all the many other artists out there. Shows keep you motivated and taking on the next big challenge makes you a better painter. - If you do enter a piece, hopefully this binder will help you keep track of what's spoken for already. Don't embarrass yourself by entering the same piece in two shows by mistake. Again, if you enter and get accepted, you'd better be ready to ship that painting out. - Buddy up with someone. If you get accepted and you know that the ship date falls during a time when you might be traveling, have an artist friend (or family member) ready to ship it for you. That could mean packaging it up ahead of time, just in case, or your friend (your very GOOD friend) could do that for you. Online Competitions for you to consider entering (although some of them also hold "send in" competitions as well. I hope this helps some of you. Let me know! (and feel free to ask your own questions in the Comments). You can find all that info right HERE. Non-painting spouses are also invited! Thanks for visiting...won't you subscribe? Thx in advance for sharing my blog! And if you do, pls give me appropriate copyright credit.. Simple theme. Powered by Blogger.